What Chance Do Carriers Have in Asia in a Post-INF Treaty World? The extent to which the above-surface environment in the Western Pacific becomes more lethal for big ships should matter at the margins for carrier procurement. How much of a future do aircraft carriers have in the Indo-Pacific? A recent panel at the Maritime Security Challenges Conference revisited this question, which in some ways we’ve talked to death. Critics and proponents of the aircraft carrier have argued about the form’s merits since at least 1945. The navies of the Indo-Pacific seem to have largely answered this question in the affirmative, as India and China continue to build up their fleets, and the United States invests in a new generation of supercarriers. Jeffrey Hornung of RAND discussed the ups and downs of Japan rejoining the carrier club in a recent article. Long story short, carriers offer a real capability, but their expense crowds out other options. The U.S. decision to abandon the Intermediate-Range Nuclear Forces Treaty adds a wrinkle to this question. T.X. Hammes, among others, has argued that ground launched cruise missiles already outrange carriers at considerably lower expense. Such missiles can deny Chinese access to the East or South China Seas (assuming sufficiently friendly allies) without the need to deploy large, flat-decked aircraft carrying ships, or even other vulnerable surface vessels. Andrew Krepinevich made a similar argument with respect to “archipelagic defense.” In short, land-based missiles can render an environment lethal for carriers (and any other surface ship) without running the risks that surface ships, submarines, and aircraft normally face. Mobile missile launchers are easier to hide and harder to sink or destroy than carriers or air bases. At the moment, any serious discussion of a competition with ground-launched cruise missiles (GLCMs) and anti-ship ballistic missiles (ASBMs) on one side and carriers and their surface escorts on the other remains purely notional. China has the world’s largest and most advanced inventory of short and medium ranged missiles, but continues to build both aircraft carriers, and the surface escorts needed to defend them. China seems to believe, the anti-access merits of GLCMs and ASBMs aside, that carriers have sufficient military virtue to justify procurement. Still, the extent to which the above-surface environment in the Western Pacific becomes more lethal for big ships should matter at the margins for carrier procurement. Indeed, it should matter a great deal for Japan’s thinking about the future of the Izumo class carriers. 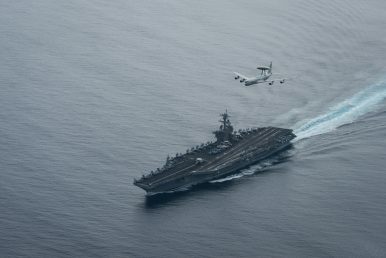 They can already conduct many of the missions that aircraft carriers are often tasked with, including human assistance/disaster relief, anti-submarine warfare, and “show the flag” diplomatic operations. Spending the money to add a few F-35s to a small platform might not seem terribly efficient in the context of an increasingly lethal sea-space. Then again, GLCMs depend on good data for over-the-horizon targeting, and the ability to fly advanced stealth fighters might make it easier for Japan to integrate the Izumos with its own ground-based missiles in order to create an exceedingly uncomfortable environment for Chinese ships in the East China Sea.